This is perhaps one of Mucha’s best-known advertising posters, with numerous editions subsequently published in a variety of formats for international markets. This poster established the iconic image of the ‘Mucha woman’ with her swirls of exaggeratedly abundant hair. 'JOB' is a trademark for the Joseph Bardou Company, manufacturers of cigarette papers. In this poster, Mucha placed the prominent female figure against a background featuring Job monograms. Holding a lighted cigarette in her hand, the woman leans her head backward sensually, and the rising smoke forms an arabesque, intertwining with her hair and the company logo. Mucha introduced a Byzantine effect, as seen in the Gismonda poster, with the border decoration inspired by mosaic work which adds an air of dignity to a commercial poster. 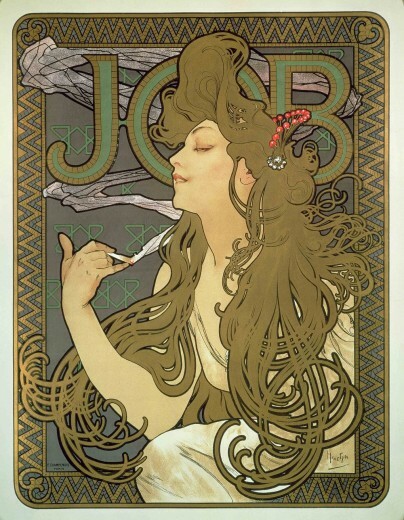 In 1898 Mucha produced another design for Job which is known as 'great Job'.